﻿﻿Nature center studies wildfire's effects on Chihuahuan Desert. ﻿﻿﻿﻿﻿The Chihuahuan Desert Nature Center was lucky to escape relatively unscathed from the devastating Rock House fire that roared through 315,000 acres of the Davis Mountains and the Trans-Pecos in April 2011. The horrific wildfire, however, was only one threat in a year of extremes, including sub-zero February temperatures, a freak August monsoon that scoured the landscape and the subsequent drought that endures today. 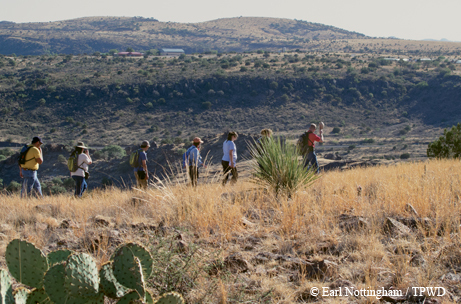 Research into the wildfire’s impact takes center stage now at the 36-year-old nature center near Fort Davis as Sul Ross State Uni­versity students and volunteers chronicle the fire’s negative effects on some desert species and the amazing resilience of others. Much of the research focuses on the grassy northern reaches of the center’s property that were hit by the fire. ■ Forbs (broad-leafed plants) in five families were in bloom less than two weeks after the fire. ■ Oaks fared well where fire-adapted strategies were employed, but most junipers succumbed. ■ Leafy succulents, such as yuccas, began to recover quickly, along with small, cylindrical cacti. ■ Cane cholla suffered a significant loss, while prickly pears fared a bit better. The institute was established in 1974 by a cadre of Sul Ross professors and Alpine community members dedicated to gathering and disseminating knowledge about the vast and little-explored desert wilderness. Money to purchase the 507 acres of high desert country between Alpine and Fort Davis, which is blessed with rare desert springs, igneous rock outcroppings, a picturesque canyon and stunning hilltop vistas, came from community fundraisers and private donations. A considerable sum of money came from yearly auctions held by West Texas oilman/rancher Clayton Williams, who sold everything from a zebra to the “shirt off his back” to support his pet cause. But the 200,000-square-mile Chi­huahuan Desert — stretching across West Texas and the southern reaches of New Mexico and Arizona and some 800 miles south to San Luis Potosi, just north of Mexico City — is no joke. The largest of North America’s four deserts, the Chihuahuan, which averages 4,000 feet in elevation, encompasses one of the most ecologically diverse arid regions in the world. Its elevations range from about 1,000 feet, where cacti, succulents, grass and small shrubs dominate, to mountains rising more than 10,000 feet, home to coniferous forests. The result is an incredibly diverse habitat occupied by a stunning variety of plants and animals. In fact, the Chi­huahuan Desert supports one of the richest bat faunas found anywhere and the greatest number of cacti and succulent species in the world. ﻿The Chihuahuan Desert Nature Center offers several miles of trails, such as the 2.25-mile Outside Loop Trail, on its 500 acres. Areas across the canyon have been recovering from 2011's Rock House blaze. 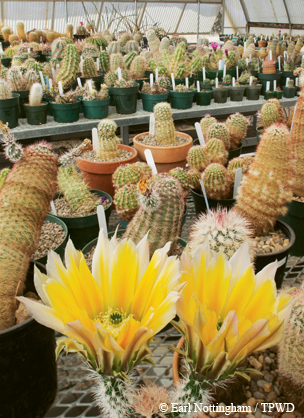 More than 200 of those species may be viewed inside the Chihuahuan Desert Nature Center’s Cacti and Succulent Greenhouse, located in the Botanical Gardens. The world’s largest collection of Chihuahuan cacti and succulents grows inside the 1,400-square-foot greenhouse, where visitors can gaze upon row after row of otherworldly looking thorny plants ranging in size from potted specimens no bigger than a thimble to human-sized cacti rising from the ground. Of the collection, many of which are indigenous to Mexico’s northern reaches of the Chihuahuan Desert, about a quarter are considered rare or endangered, Hoyt says. The center does a lot of hand-pollinating — collecting seeds and growing them in the high humidity inside the greenhouse. Visitors to the nature center can take a half-mile guided walking tour of the Botanical Gardens with more than 165 species of plants native to the region. Plants are identified and grouped by families, such as the catalpa family (desert willow, trumpet flower) and agave family (lechuguilla). A short spur leads to Cactus Hill, which includes a pollinator garden, a solar water feature and a scenic overlook affording an unobstructed view of 6,200-foot Mitre Peak. The one-third-mile Hum­ming­bird and Butterfly Trail circles the base of a picturesque rock outcropping. ﻿﻿Desert plants in the greenhouse. At the visitors center, indoor displays explain the importance of the Chihuahuan Desert. Two 3,000-gallon tanks collect rainwater off the metal roof. In addition to providing precious water for the center in an arid area that averages 17 inches of rain annually, most of which falls during summer’s “monsoon” months, the rainwater collection system serves to educate the public about the importance of water conservation. Hoyt recalls with a chuckle the initial reaction from many residents of the Jeff Davis-Brewster-Presidio tri-county area when she proposed having the rainwater harvesting system installed. Hoyt believes the nature center helps raise public awareness of the fragility and importance of the Chihuahuan Desert and serves as an example of what is possible in such a harsh environment. 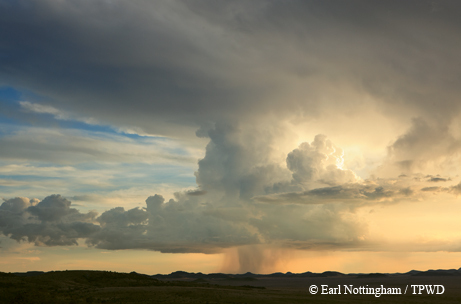 ﻿﻿﻿An evening storm brings rain to the Chihuahuan Desert. The use of native flora in private and public landscaping in the area has grown in recent years, spurred in part by the center’s annual native plant and cacti sales. Several native plant nurseries also have opened in Fort Davis and Alpine. Mexican feather grass, cenizo, yucca, ocotillo, Texas mountain laurel, desert willow and other natives, many purchased at the nature center’s annual plant sales, have been used to landscape everything from fast-food joints to the grounds of the Brewster County Court­house in Alpine. Education remains central to the nature center’s core mission. Bug Day in May, for example, draws as many as 300 kids. Summer camps offer youngsters opportunities to learn about desert ecology and desert critters. Hundreds of students from throughout Texas come for hands-on workshops and events, such as The Earth Rocks! held in October during Earth Science Week. Educational opportunities abound for adults as well. The center boasts more than 100 “citizen scientist” volunteers who help center staff with plant sales, bird and butterfly counts, tours and various research projects. A Life-Long Learning Program draws scores of interested adults from throughout the Trans-Pecos for field trips, lectures and films. 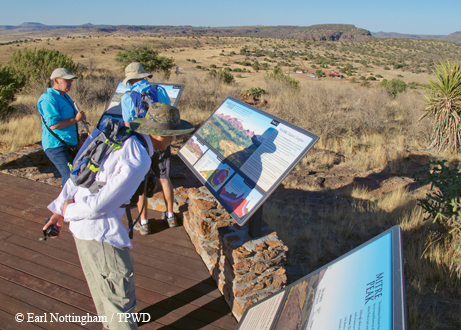 Around 6,500 people visit the nature center each year to tour the 20 acres of native plant and cacti gardens, hike five miles of canyon and mountain trails and peruse a geologic timetable of the Trans-Pecos region. A replica of a 19th century mine, replete with a headframe, mining artifacts from Mexico, West Texas and New Mexico, and samples of minerals and ores, illustrates the northern Chihuahuan Desert’s fascinating mining history. ﻿﻿﻿Visitors check out the view of Mitre Peak and the surrounding area at a scenic overlook at the Chihuahuan Desert Nature Center. What most visitors can’t see is the ongoing research that will help scientists better understand the nuances and complexities of the Chihuahuan Desert’s ecology as well as the impact of wildfires and a changing climate. Already, Hoyt documented a decline of roughly half the center’s butterfly population, which once counted 115 species but was hit hard by the 2011 wildfire that burned host grasslands and forests. She sees butterflies as an indicator species and has been monitoring their populations for the past six years. The Texas Parks and Wildlife Depart­ment provided a wildlife diversity grant for the study of pollinators of rare plants at the center, where it is hypothesized that part of a plant’s rarity might be a result of not only low seed production or nonviable seeds, but also the lack of pollinators or the right kind of pollinator for plant propagation. Desert pollinators tend to be butterflies, bees and hummingbirds, the latter of which thrive in the Davis Mountains. The institute enjoys a symbiotic relationship with Sul Ross State University in Alpine, working with professors and graduate students on research projects. One master’s degree candidate has been studying the bird population’s response to the Rock House fire. The Chihuahuan Desert is often dismissed by the casual observer as a vast, arid and seemingly empty wasteland devoid of any aesthetic qualities of note. One warning: Be careful to avoid things that poke, sting or bite as you admire the magenta blooms of the cholla, flowering prickly pears, the red blossoms of the ocotillo and the shimmering silver-blue foliage of the lacey oak and inhale the intoxicating, rain-scented aroma of the desert creosote. Hours: 9 a.m. to 5 p.m. Monday through Saturday; closed Sundays. Open year-round except: New Year’s Day, Thanksgiving Day and Christmas Day. Admission: $6 adults, free to members and children 12 and younger.